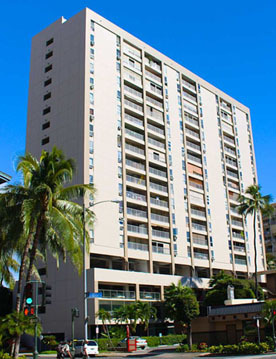 Walt Flood Realty, specializing in condominium sales and property management in Honolulu and Waikiki, Hawaii. Super opportunity to own a rarely available Ocean View in the Keoni Ana. 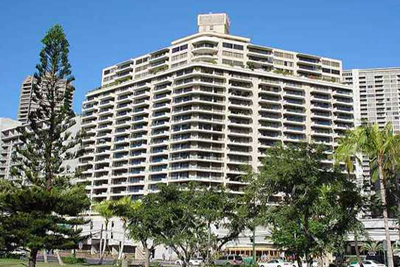 Location: The Ritz-Carlton Hotel/Condo is just 4 blocks DH on Kuhio Ave.
*For more information and pictures, click on the building. Super opportunity to own a rarely available High Floor. 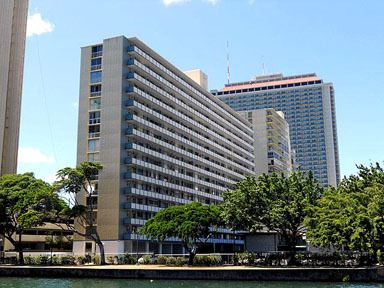 Enjoy an easy lifestyle with walking distance to world famous restaurants and shopping centers in Waikiki. Just 4-blocks to Waikiki beach. There is 24/7 InHouse-Security, street level guest parking (6). Location: In the neighborhood of the new Ritz-Carlton Hotel/Condo. This condo was renovated with new floors, new appliances, new Kitchen, and enclosed the Bedroom with a solid wall, a door, closet and a window. Tandem Parking stall (2-cars) #2403. Ritz-Carlton Hotel/Condo StarAdvertiser article: Ritz-Carlton faces battle over permit for Tower 2. Generic Purchase Contract. Fourteen pages of the Hawaii Association of Realtors (important to read if you are considering an Offer to Buy - Purchase Contract © November 2015 HAR.) Note: This document can only be used/completed by a REALTOR ® . House Rules The Four Paddle House Rules, as of January 13, 2016. Click this image for multiple pictures. "SOLD - as of April 21, 2016"
Notice/Update: The Atkinson Towers Parking situation has been solved. This Condo #1003 has Parking Stall #2 assigned, as of Jan. 1, 2017. Rent is fixed for the first Five (5) years and for a term of Fifty (50) years. 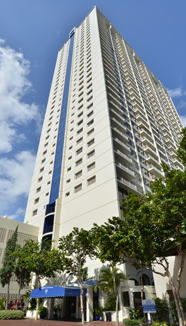 This 15 story high rise building is a block to the Hawaii State Convention Center; across the street from the Ala Moana Hotel; behind Yacht Harbor Towers and the YMCA complex; one block to the Ala Moana Shopping Center, Ala Moana Beach Park (Magic Island), Pacific Ocean, and at the entrance to Waikiki. This 10th floor apartment has a large enclosed Lanai. There are Two Bedrooms and One Bathroom. The apartment is partially furnished (appliances). There is a Washer and Dryer in the apartment. The rooms have laminate/tile floors. Atkinson Towers is a secured building, with two elevators, and there is a Maintenance Manager. The project has a pool (not heated), scheduled to be removed during this year of 2016, to created twelve (12) addtional parking stalls. There are Individual Owners' assigned storage/lockers on each floor. Basic cable TV is included in the Maintenance Fees, (high-speed internet is available). No Pets are allowed, with the exception of certified seeing-eye dogs. Interior Area: 644 sq.ft. Plus: enclosed Lanai: 126 sq.ft. : Total 792 sq.ft. Click here: How To Buy Unit #1003. Read the step by step on making an offer (Purchase Contract) to buy Condo Unit #1003. Super opportunity to own a rarely available corner / end unit in the Four Paddle. 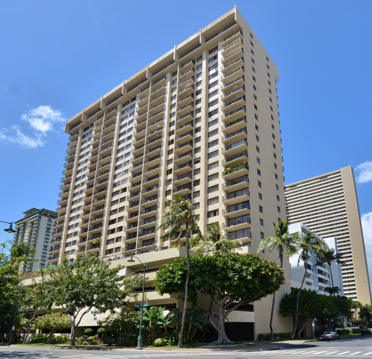 Location: The Ritz-Carlton Hotel/Condo is right across Kuhio Ave.
*For more information and two pages of pictures, click on the building. The Villa at Eaton Square Condominium. *For more information, FAQ, and multiple pictures click on the image of the building. Atkinson Towers - Condominium Unit #1102. Status: SOLD as Oct. 16, 2014. *For more information, pictures and video click on the picture of the building. Sample MLS Purchase Contract. Fourteen (14) pages of the Hawaii Association of Realtors (important to read if you are considering an Offer to Buy - Purchase Contract © 2013 HAR.) Note: This document can only be used/completed by a REALTOR (R). Atkinson Towers - Condominium Unit #1403. 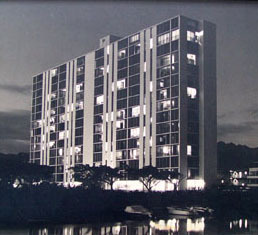 Atkinson Towers - Condominium Unit #604. Atkinson Towers - Condominium Unit #1605. Status: SOLD as April 27, 2012. Atkinson Towers - Condominium Unit #1506. 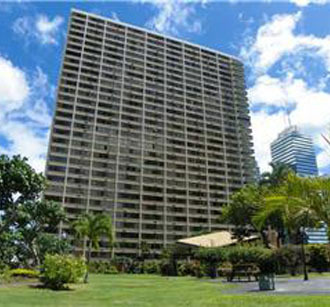 Kukui Plaza - Condo Unit #D1014.